‡Adequate calcium and vitamin D throughout life, as part of a well-balanced diet, may reduce the risk of osteoporosis. Bone collagen provides the "binding sites" for calcium. All calcium must "bind to" collagen in order to become part of bone. Age-related collagen loss leads to diminished calcium content and reduced bone mineral density. Healthy Bones Plus is clinically proven to generate bone collagen and increase bone mineral density at the critical hip region. 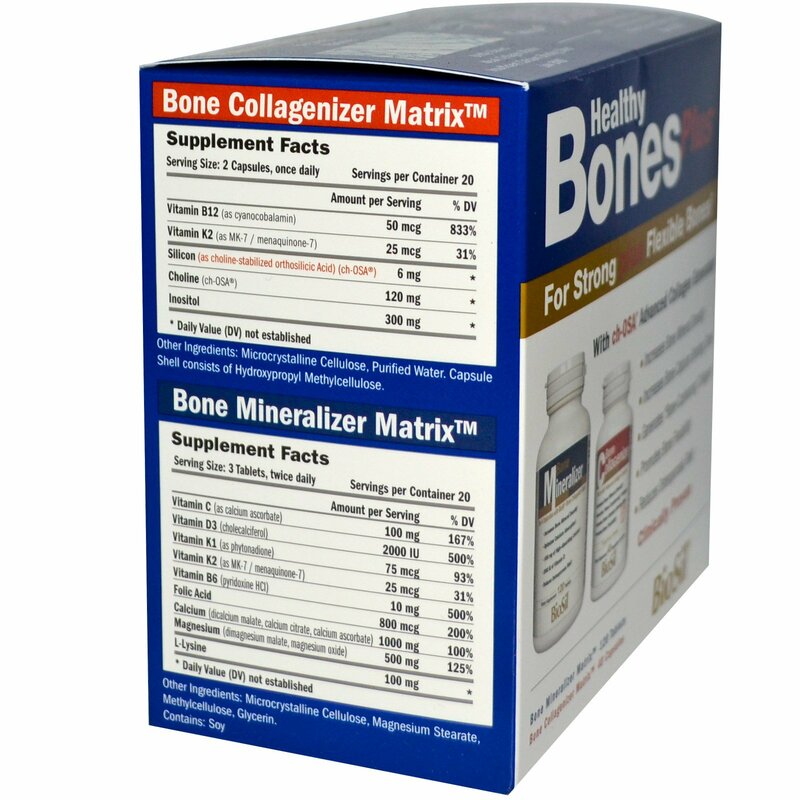 Collagen gives your bones flexibility and their ability to withstand physical stress, as from impact. 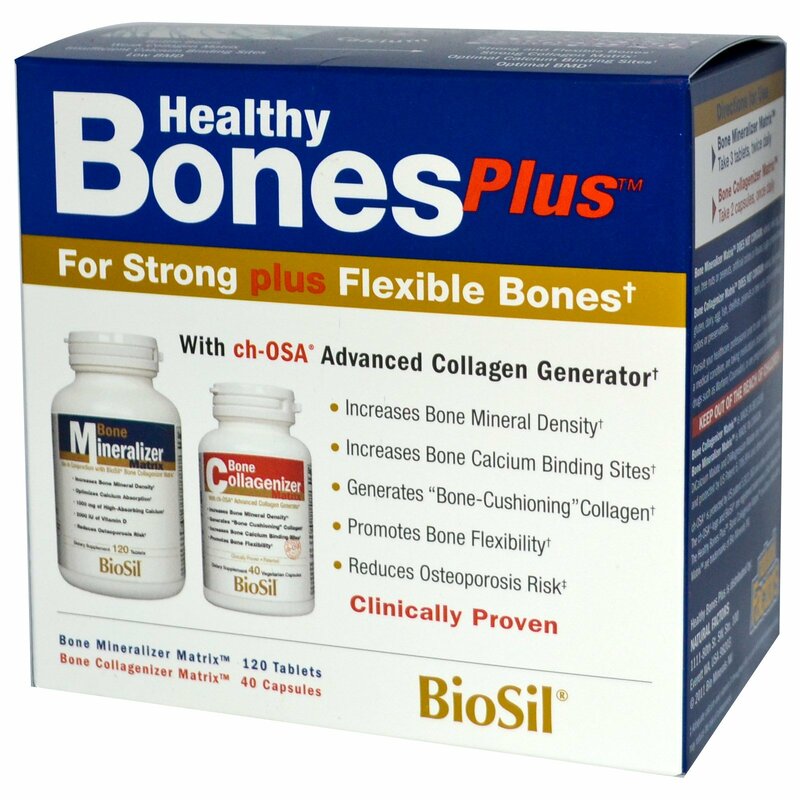 Healthy Bones Plus is clinically proven to increase bone collagen formation. Increasing your bones' total strength requires both "hardness," determined by the calcium content of your bones and "toughness" (flexibility), determined by collagen. New Healthy Bones Plus promotes both types of bone strength. Supplies your bones with a rich source of premium high-absorbing calcium and vitamin D. Key transporters ensure delivery from bloodstream to bone. Take 2 capsules, once daily. Take 3 tablets, twice daily. Microcrystalline cellulose, purified water. Capsule shell consists of hydroxypropyl methylcellulose. Does not contain: wheat, soy, yeast, gluten, dairy, egg, fish, shellfish, peanuts or tree nuts, corn or artificial colors or preservatives. Microcrystalline cellulose, magnesium stearate, methylcellulose, glycerin. Does not contain: wheat, milk, egg, gluten, tree nuts or peanuts, artificial colors of flavors, sugar, preservatives. Consult your healthcare professional prior to use if you have or suspect a medical condition, are taking medications (especially anticoagulant drugs such as Warfarin/Coumadin), or are pregnant or lactating.